ROBOLAB is software to move the LEGO MINDSTORMS for Schools. It supports both the NXT, the RCX. For information about which versions of ROBOLAB is here for your references. 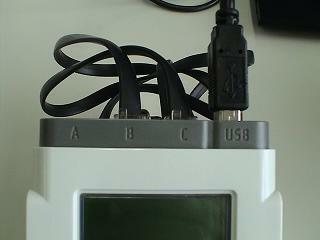 In this case, from the use of ROBOLAB, let's make one by one up to create a simple program. 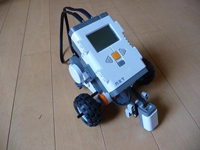 In order to know how to use the ROBOLAB, it is better placed to make the robot. LEGO Mindstorms NXT for basic set, you can find how to make that hockey robot. While watching this, let's create a robot such as photos. Of course, it is also good if the robot is already made. As far as hockey robot is attached a light sensor. Well, the robot is complete, you may want to confirm. It is the NXT intelligent block, in which output port is connected to the motor. This time, the motor of the left connected to port C output as seen from back side of the robot, the motor of the right was connected to B. It will be changed the program depending on whether you are connected to the motor to which output port, so please note that.